Have you ever done a "No Spend" Challenge? Some try going all month without buying Starbucks, while others may go the whole month buying only Gas and Groceries, and Bills. A new month is beginning soon, so there's no time like the present. At the end of the insert, write in your exceptions: Bills, food, gas, weekly manicure, etc., and see if you can go all month without spending money. 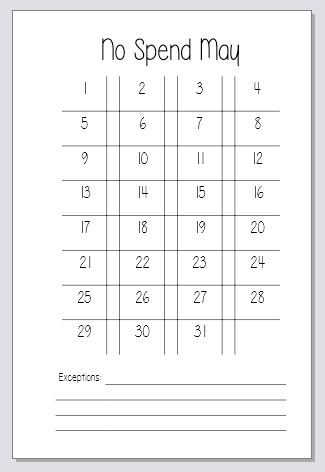 This tracker is designed to be 4x6 and can be printed on a 4x6 card (if your printer does that sort of thing), or you can print it on regular paper and then trim it to sie. Thanks for this! I was planning on doing a no-spend May (gas and food are exceptions) and was trying to figure out a way to track it! Now I don't have to come up with anything. I'm planning a no-spend January. This tracker design is just what I was looking for. Thanks.